Ford Rouge Complex, 1927Detroit Publishing Co.
With hundreds commissions in Detroit, it's not hyperbole to say that Albert Kahn, one of the most important architects of the first half of the 20th century, built the Motor City. Many of his buildings have been designated National Historic Landmarks and are adorned with Michigan historical markers. A versatile architect, Kahn didn't limit himself to any one style or type of building, designing an array of skyscrapers, factories, public buildings, and residences over his career. From the arresting Fisher Building to the behemoth Packard Automotive Plant, Kahn's contributions within the city of Detroit are well-known. His commissions outside the city, however, deserve equal fanfare. True, there's significantly fewer Kahn-designed buildings in the suburbs, the majority of which are mansions or halls in upscale towns like Franklin, Bloomfield Hills, and the Grosse Pointes, but there's much to appreciate in these works. Below are three examples as noteworthy as Kahn's most celebrated Detroit designs. The Fords were the power couple of Jazz Age Detroit. Both scions of two of the region's wealthiest families (Edsel, of course, was Henry Ford's only son, and Eleanor was the niece of Detroit retail giant J.L. Hudson), the Fords' station required a residence suitable for entertaining illustrious guests with lavish parties. Who better to design it than Detroit's premier architect, Albert Kahn? Located in Grosse Pointe Shores, the Edsel and Eleanor Ford House is a monument to affluence that somehow manages to feel homey. Completed in 1926, the 60-room, 20,000-square-foot mansion cost $3.2 million to build – a staggering $40 million in today's dollars (and that's before taking into account furniture, fixtures, and artwork, like a 2,000-year-old ceramic wine jar from Han-dynasty era China and original paintings by Cezanne, Degas, Renoir, Matisse, Rivera, Fra Angelico, and Van Gogh, all of which have appreciated significantly). The Fords maintained a staff of 35, including an English butler and a French governess, to care for the house and family. Kahn designed the asymmetrical house like an authentic cottage from Cotswold, England, which traditionally added sections to meet the needs of a growing extended family. Entire features and materials were imported from around the world: stone for the roof came directly from the Cotswold region, linen-fold panels were taken from a 16th century English house, and a dressing table from Louis XV-era France and furniture from different European periods and places were installed throughout. Though the Fords wanted their house to look and feel old, they added many state-of-the-art touches. The so-called "modern" room is the house's most unique. It is sleek like a car from the 1950s (though designed much earlier), with straight lines and smooth surfaces made out of exotic, industrial materials: leather, bronze, glass, cork, and formica, which was new at the time. 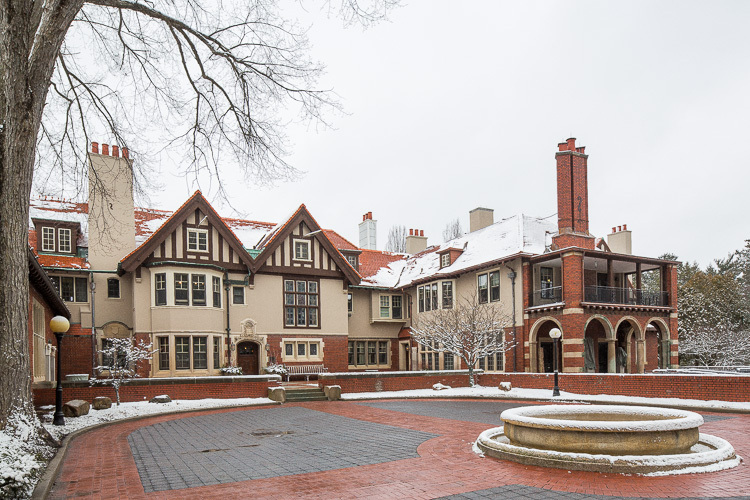 From a private residence to a state-of-the-art factory, Albert Kahn's commissions for the Ford family proved that he could design any type of structure. 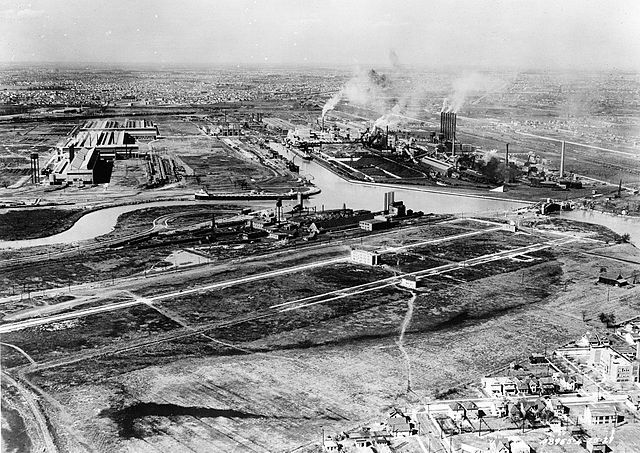 Henry Ford had ambitious plans when he purchased 2,000 acres of marshland in Dearborn in 1915. When it was completed in 1928, the Ford Rouge Factory, or simply "The Rouge," was the most advanced and comprehensive industrial facility ever built. In its 1930s heyday, the complex was essentially a large city packed into 1.5 square miles, featuring three clinics and its own police and fire stations. Over 100,000 autoworkers toiled in The Rouge's 93 separate buildings (not all of which were designed by Kahn). There are many statistics that testify to the factory's scope, but this one's great: every month, to properly clean the facility, 3,500 mop heads had to be replaced. The Rouge was a quintessential example of "vertical integration" -- the process of turning raw materials into a finished product on a single site. Steel, rubber, and silicon dioxide arrived by barge and train. Out came parts and finished automobiles several days later. Due to the complexity and coordination of so many processes, it's difficult to express what an achievement the Rouge was. "The innovation is not in the individual structures, but in having them all sited together and owned and operated as a single unit," says Matt Anderson, curator at The Henry Ford. That said, it's still possible to admire The Rouge's buildings individually. Take the glass plant, which not only manufactured glass, but revolutionized factory design with its glass upper walls and roof that admitted sunlight. Only in recent history has evidence backed Kahn's idea that natural light improved worker welfare and productivity. Today's Rouge bears little resemblance to the raging, roiling, dense complex of the 1930s. The Ford Motor Company has completely modernized the Rouge twice, which required wholesale demolition and construction. Only a handful of Kahn-originals remain. Fortunately, one is the glass plant, which is now used for offices and a greenhouse. "Albert Kahn's firm designed factories for powerful entrepreneurs," says Greg Wittkopp, director of collections and research for the Cranbrook Center. "If he worked well with them, he'd design their homes and offices, too." This was the case for the Fords. And it was also the case for the Booths. George Booth was a media mogul who started the Detroit News along with seven other Michigan-based newspapers. Kahn designed the Detroit News Building downtown, as well as the Booth's mansion in Bloomfield Hills -- the stunning Cranbrook House and Gardens. The Booths were true patrons of the arts. They had an impressive contemporary art collection, and later expanded their estate into an educational campus for artists. But first came their house in 1908, one of Kahn's early commissions. It is a shining example of the era's Arts and Crafts movement, which embraced simplicity, craftsmanship, and traditional materials. Unlike the Fords, who imported materials and objects, the Booths wanted their house to be American-made. The stone for the walls came from their own grounds, the tiles from Pennsylvania. Numerous craftsmen were commissioned to carve ceilings, weave tapestries, and make stained glass windows. Johannes Kirchmayer from Boston was hired to carve the spectacular wood reliefs above the library fireplace -- there's even one of Albert Kahn. A small but important feature is a side door in the front vestibule that leads to Booth's office. That way, guests coming for business wouldn't have to intrude in the domestic portion of the house. While the Tudor Revival doesn't make quite as grand a statement as the Ford House, what really sets the house apart is its integration with the surrounding landscape and gardens. "George Booth worked with Kahn to create series of terraces, then with landscapers and gardeners for details," says Wittkopp. "But the broad strokes were done by Kahn." The house's grounds total 40 acres, no portion of which went untouched by the Booths. To them, the natural scenery was just as important as the house itself. They planted eighty-five percent of the trees on the grounds today. The marvelous gardens are made anew every year by volunteers who never repeat the same combination of flowers and shrubs. The Booths also had one of America's first Japanese gardens. There's way more to appreciate in these and other Kahn buildings than can be described here. Fortunately for you, many of Kahn's suburban commissions offer tours. The Ford House is a unique case in that most of its original details have been preserved, in large part thanks to the sizeable endowment Eleanor Ford left for the house's maintenance and staffing. (Even pieces that were donated to the Detroit Institute of Arts have been replaced with replicas.) For this reason, tours of the Ford House and its grounds, which are offered six days a week, provide an accurate glimpse into the world in which the Fords lived. The Ford Factory Tour, on the other hand, takes place in a newer, non-Kahn designed building where visitors can view major sections of the Ford F-150 assembly. Modernization and automation have created a factory have transformed The Rouge into something Kahn would have a hard time recognizing. Today just 4,300 employees work at the complex that once employed 100,000 in its heyday. Yet the factory's adaptability 90 years after it opened is a testament to the quality of Kahn's original designs. The Cranbrook House and Gardens was the first piece of what has become the Cranbrook Educational Community. Though most of the buildings on campus were designed by another Detroit architectural legend, Eliel Saarinen, Albert Kahn's Cranbrook House, whose first floor and grounds are open for tours, remains a standout. Tours begin in June and, thanks to sponsors, the gardens can be visited for free this year. Click here for more information.